Kazakhstan’s Air Astana is planning to accelerate expansion as part of a new 10-year business plan. The airline could potentially double in size over the next 10 years, driven by growth in transit traffic. Under the new business plan Air Astana will likely focus on adding new destinations in China and South Asia while growing capacity to most of its existing destinations. A switch from a dual to single hub strategy will also help support an increase in transit traffic, which is expected to account for 30% of total traffic compared with approximately 10% currently. Transit traffic will unlock a new growth phase for Air Astana, which has experienced a significant slowdown in growth over the last three years. However pursuing rapid expansion and more transit traffic can be risky, leading to more intense competition and requiring significant investment. An IPO, which is back in the pipeline after several years of delays, would help fund the expansion – assuming that investors are not scared away by the risk associated with competing against larger network airlines. This is Part 2 of a report on Air Astana. In the first instalment CAPA examined how Air Astana had nearly doubled sixth freedom transit traffic over the last year, enabling it to offset a decline in local traffic and maintain profitability despite challenging conditions in its home market. Air Astana is now considering the pursuit of further increases in sixth freedom traffic as part of a new strategy aimed at accelerating expansion while leveraging its low cost structure and geographic position. In this part CAPA reviews the fleet, network and hub implications of Air Astana’s new strategy, as well as analysing the airline’s CASK advantage, future outlook and IPO potential. Air Astana currently operates a fleet of 30 aircraft across a network of 42 destinations (29 international and 13 domestic). Over the last two years the fleet has shrunk by one aircraft while two destinations have been added. 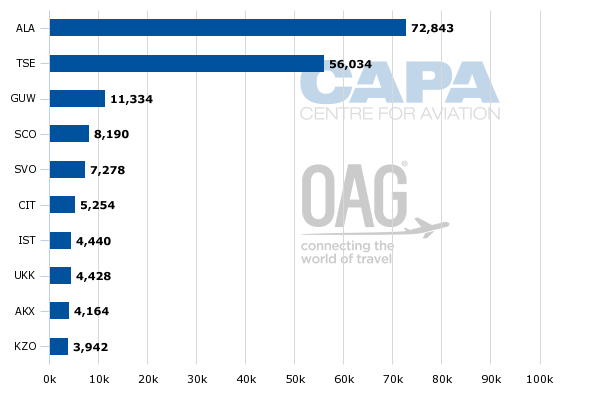 As CAPA outlined in the first instalment, passenger traffic is currently at 2013 levels. ASK capacity levels are still up approximately 6% compared with 2013, but capacity growth has slowed significantly following a rapid initial decade of expansion. Air Astana commenced operations in May-2002. Under Air Astana’s previous business plan ASK growth of 4% to 5% per annum was planned for the next several years, with the exception of 2017. While Air Astana cut its initial ASK projection for 2016 from 4% growth to a 3% reduction it is still planning to maintain the original projection of 10% growth for 2017 to leverage its host airline role in EXPO 2017. EXPO 2017 will be held in the Kazakh capital Astana, one of Air Astana’s two hubs, from 10-Jun-2017 to 10-Sep-2017. Under the previous business plan the relatively modest rate of capacity growth was supported by modest expansion of the fleet from 30 aircraft at the beginning of 2016 to 35 aircraft at the end of 2019. Air Astana currently has 14 aircraft on order, all of which are slated for delivery by the end of 2019. Air Astana is also planning to phase out nine of its existing aircraft during this period, for a net addition of five aircraft. The first A320neo is slated to be delivered by the end of 2016 and is the first of five growth aircraft in the current fleet plan. The current fleet plan also includes one growth aircraft in 2017 and three growth aircraft in 2019 – a milestone year with nine deliveries and six returns. Air Astana expects to make adjustments to its fleet and capacity plan once it completes a new 10-year business plan. Seabury is expected to finish work on the new business plan within the next month. The brief to Seabury is essentially to convert Air Astana into a network airline. The network and fleet will be reworked to support the new strategy. While the new business plan has not yet been completed, the expectation is for Air Astana to approximately double in size over the next 10 years – to 60 aircraft. Air Astana will look to place new orders – and potentially make some adjustments to its existing orders – to enable implementation of the new 10-year business plan. The appropriate regional jet/narrowbody/widebody mix is now being reviewed as the business plan is developed. More orders for A320neo family aircraft are likely since the A320/A321 is the backbone of Air Astana’s fleet. Air Astana has already acquired four A321neoLRs to replace its 757 fleet and could acquire more of the new long-range variant to support expansion in the Europe and East Asia markets. The three 787s on order were intended for new routes to North America, but this acquisition is being relooked at as part of the current review. The current review is also assessing potential new regional jets. Overall, a significant number of new orders would be needed for Air Astana’s fleet to reach 60 aircraft by the end of 2026. In addition to the 25 growth aircraft, replacements will likely be required in this timeframe for the E190s, the 767s and the remaining A320/A321ceos. The additional capacity generated by the growth aircraft will be deployed in markets where there are transit traffic opportunities. The bulk of the additional capacity will be allocated to existing international markets, with a focus on markets that can support more transit traffic. Focusing primarily on existing markets is sensible as it is less risky than launching new destinations. Air Astana should be able to leverage its success in existing markets, where it has built up a strong brand and reputation. There are huge opportunities to add frequencies as most of Air Astana’s destinations are not currently served daily. A daily service will improve the airline’s position for local business traffic as well as its position in the sixth freedom market, since most of its competitors already offer a daily product. Of Air Astana’s 44 international routes, the airline currently only offers a daily product on 10. Of these 10, eight are served once per day and only two have more than seven weekly frequencies – Almaty and Astana to Moscow. Air Astana also plans to transition from a dual hub to single hub strategy as it implements its new business plan. Focusing on a single hub will enable it to improve its transit product, resulting in better and more frequent connections. Astana is expected to be selected as the airline’s main hub as the airport does not have the infrastructure constraints of Almaty. A new terminal in Astana is slated to open prior to EXPO 2017 – doubling the airport’s capacity. Astana is already the more modern facility, with much better transit facilities. While Almaty is the largest city and will continue to be the commercial centre, Astana is growing rapidly and is the focus of government-backed investment. Air Astana currently allocates slightly less than 60% of its total seat capacity to Almaty, compared with approximately 45% to Astana. However Almaty is growing faster and has been the focus of most of Air Astana’s expansion over the last five years. Air Astana currently operates 21 international routes from Almaty and 19 from Astana (based on OAG data for the week commencing 29-Aug-2016). Air Astana’s other three international routes are Atyrau to Amsterdam (six times per week), Aktau to Istanbul (twice weekly) and Kostanay to Hannover (once weekly, seasonal). Amsterdam for now is only served from Atyrau, and Hannover from Kostanay. Istanbul is also served from Astana and Almaty. Istanbul is among 13 destinations that are currently served by Air Astana from both hubs. Almaty has eight exclusive destinations while Astana has six exclusive international destinations. Several of the Almaty exclusive routes will likely transfer to Astana, particularly those routes relying heavily on transfer traffic. Some of the routes that are now served from both hubs will likely only be served from Astana in future, enabling the airline to consolidate its operation and offer more frequencies. 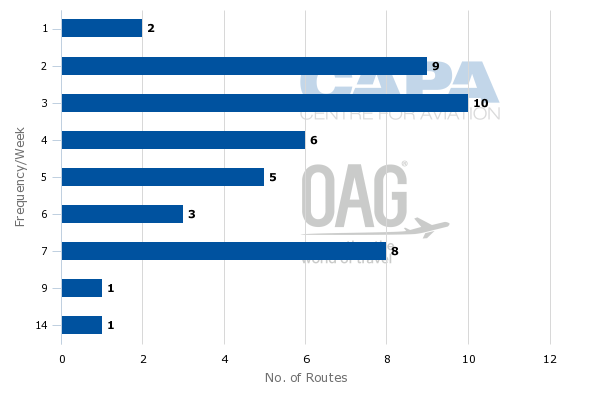 However, some of the bigger routes that attract significant local traffic (such as Moscow) will likely continue to be served from both airports. Air Astana will also pursue network expansion under its new business plan but the focus will be more on boosting capacity to existing destinations. Most of the new destinations will likely be in mainland China and South Asia. Most of Air Astana’s growth in transit traffic over the last year has been from China, particularly in the China-Europe market. Air Astana believes it has just started to scratch the surface with China-Europe traffic as it only two serves two destinations in mainland China: Beijing and Urumqi. Air Astana is aiming to add capacity to Beijing and Urumqi in the short term – as long as it succeeds at securing additional slots at both airports. The additional flights will likely be operated to Astana, where Air Astana already operates most of its European routes, although Beijing and Urumqi could be among the destinations that continue to be served from both Astana and Almaty. New services to Chengdu and Shanghai were already part of Air Astana’s previous business plan. Both cities will be included in the early part of the new 10-year plan. Several other secondary Chinese cities are also likely to be pursued in subsequent phases. Air Astana was initially planning to launch Chengdu in 2017. However Chengdu is more likely to be added in 2018 as the airline focuses its 2017 growth on existing destinations. South Asia is another target market as Air Astana currently has only one South Asian destination – Delhi – and believes there is huge opportunity for sixth freedom traffic. Air Astana already carries a lot of sixth freedom traffic from Delhi to Russia and other CIS countries. Air Astana currently serves Delhi with six weekly flights from Almaty. Astana-Delhi service and new routes from Astana to Mumbai and other Indian metros are likely to be launched in the coming years. Under its new business plan Air Astana is also likely to launch services to Bangladesh and Pakistan. In 2016 Air Astana is launching only one destination – Tehran, which has been served since late Jun-2016 with three weekly flights from Almaty. Air Astana is not currently considering any other destinations in Iran as Tehran has so far performed below expectations, with load factors of approximately 35%. In recent years Air Astana has looked at several potential new destinations in Southeast Asia and Europe – such as Singapore and Prague. However, the focus for now is on increasing frequency to its existing destinations in these regions. Under the new strategy its Southeast Asian routes may also be transferred from Almaty to Astana. There will also be opportunity to add capacity to Air Astana’s regional destinations, most of which are not yet served daily. Network expansion regionally is not necessary as Air Astana already serves all, or virtually all, of the primary cities in the Central Asia/CIS region. Air Astana currently serves 12 destinations in seven Central Asia/CIS countries. Nine of these destinations and four of these countries fall under Europe in the chart below, while three other destinations and two countries fall under Asia Pacific. Kazakhstan is also considered part of Asia Pacific but, along with most of the destinations in its regional network, is situated at the crossroads of Asia and Europe. Air Astana expects to continue growing transit traffic to regional markets, a sector it has aggressively pursued over the last five years as part of an extended home market strategy. Georgia in particular has become a fast-growing and profitable market for Air Astana, emerging as a popular tourist destination. Air Astana has also enjoyed a recovery in the Ukraine over the last year, with strong traffic from the Ukraine to China and Southeast Asia. However, Air Astana expects intercontinental connecting markets – particularly China-Europe – to be the biggest drivers of growth over the next 10 years. Air Astana believes that it has the geographic position and cost structure to compete effectively against much larger network airlines – including Gulf airlines – for this type of traffic. Air Astana’s cost per ASK is now below USD5 cents, giving it the lowest CASK among all full service airlines (from all regions) that report financials. Only a small number of LCCs – generally ULCCs – also have CASK below USD5 cents. However, comparing Air Astana with LCCs is not entirely relevant because LCCs generally have shorter average stage lengths than Air Astana’s average 2500km stage length. Air Astana does not expect that it will be able to reduce its CASK further, which has come down significantly over the last two years due to devaluation of the Kazak tenge (resulting in lower labour costs) and the reduction in fuel prices. However it is confident that it can maintain significantly lower CASK than other full service network airlines, giving it a competitive advantage. Air Astana also has an ideally located hub for China-Europe traffic, resulting in shorter flying times than those of the Middle Eastern airlines. Air Astana is keen to resume growth and believes that transit traffic is the only answer, given the limited size and the challenges of its home market. With more transit traffic Air Astana will be able to move on from a difficult three-year phase, in which it has had to cut costs multiple times and slow down expansion in order to maintain profitability. However, Air Astana will inevitably face new challenges as it focuses more on sixth freedom traffic. Air Astana does not have a widely recognised brand outside its home region and is much smaller than most network airlines, which enjoy greater economies of scale and have the ability to outmuscle smaller competitors. Air Astana has a very low cost structure but its costs will start to creep up, and at the same time yields could decline as it starts to pursue more transit traffic in a highly competitive marketplace. The change of strategy is needed to unlock a new phase of growth but could come at the expense of profitability. It is a brave – and probably necessary – move by a well-managed airline that has consistently outperformed expectations and emerged as a leader in a challenging part of the world. Air Astana has been in the black every year since 2003 – a remarkable achievement that helps make it an attractive investment as an IPO is again planned. Air Astana has delayed IPO plans multiple times since an initial 2012 target but recently put the IPO back on the front burner. Mr Foster told CAPA that an IPO is now planned for between Oct-2017 and Oct-2018. Air Astana will initially list on the Kazakhstan Stock Exchange with a potential second listing in Hong Kong, Singapore or (most likely) London. The airline could use the proceeds to fund accelerated expansion while partially buying out its two shareholders – the Kazakh government’s investment arm and BAE Systems. Air Astana’s track record of consistent profitability, a very low cost structure and leading position in an emerging market at the crossroads of Asia and Europe are all major strengths that position the airline for a potentially successful IPO. However, the new strategy of accelerated expansion and reliance on transit traffic ushers in a new more risky chapter. Investors may be impressed by Air Astana’s 15 years of achievements, but fearful of the challenges that lie ahead.